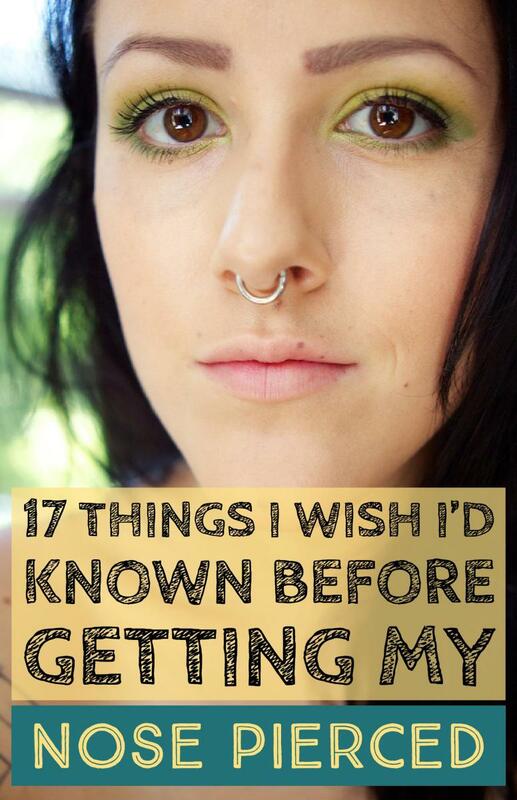 Whitney is an expert on piercings and tattoos, with experience in the body modification world. Navel piercings (belly-button piercings), are a common body piercing among women and some men. They heal relatively quickly with few complications, like ear piercings. But at times they heal more like a surface piercing, with rejection and migration risks. For the most part, if you follow proper aftercare and healing procedures, you can successfully heal the piercing, unless your body just refuses, which is always a possibility. Healing a belly-button piercing can be complicated by clothing and friction. Because it's near the waistline, you have to take into account pants, belts, and shirts that could catch on or irritate the piercing, especially considering how often you bend at the waist. New piercing shortly after getting pierced. 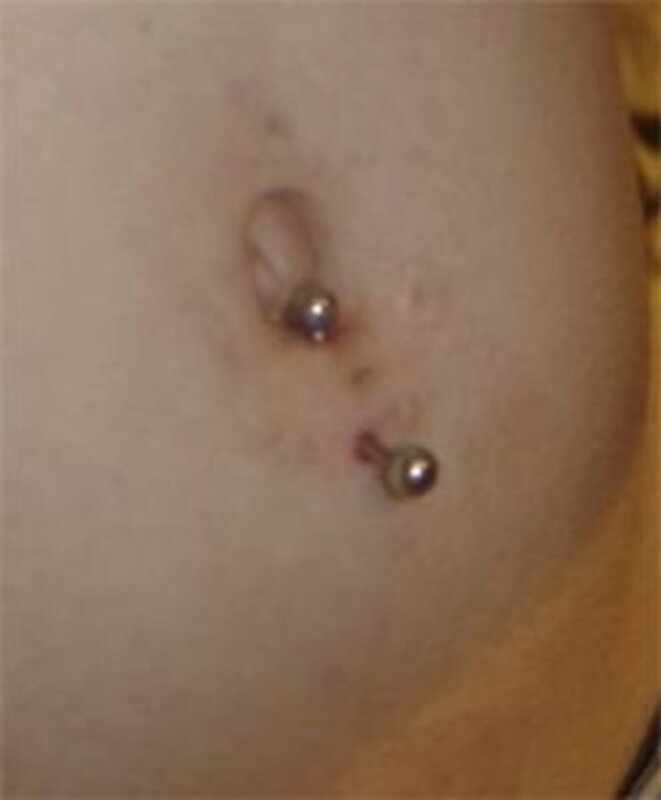 Upper Rim: The standard belly button piercing, at the top of the navel ring. Lower Rim: At the bottom of the navel ring. Sides: Anywhere in between the upper and lower navel ring; typically the horizontal left or right sides. 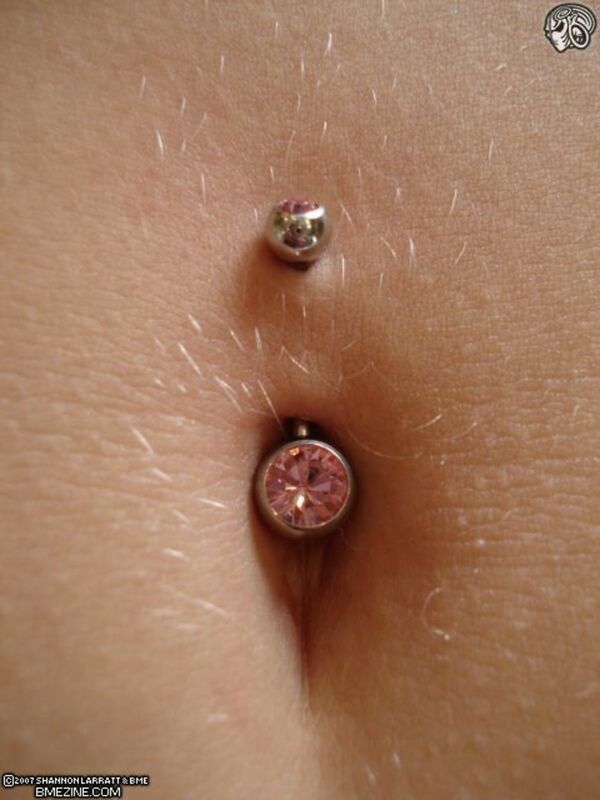 Some people have been known to get their actual navel (outtie) pierced, which could be called a true navel piercing. However, in my opinion, piercing an outttie should never be done due to the numerous problems that can present themselves from healing, misplacement, and movement. It's not safe. Don't do it. Some people get surface piercings around the navel to accentuate a standard navel piercing. These are not technically belly-button piercings. If you stick to proper aftercare and cleaning, you should have minimal problems with just about any piercing. After you get the piercing, make sure that you have a pack of miniature Dixie cups and saline solution: not "contact cleaner," but "saline solution" sold at a pharmacy. Or use a dilute solution of sea salt (1 teaspoon sea salt to 5 ounces water). Clean the navel piercing at least two to three times a day. Make sure to use a NEW, unused Dixie cup each day, using just enough saline to fully submerge the piercing. Lay on a flat surface with the cup turned upside down on your belly, in order to fully submerge the navel, allowing the saline to work its way through the piercing. Afterwards, you can dip a Q-Tip into the saline solution and gently go around both holes of the piercing to remove any excess crust or dried blood or fluids. There is NO other reason to touch the new piercing. Continue the process for at least a month to make sure things are fine. You may experience crust or dried fluid for some time. Whenever this happens, use the Q-Tip to remove the dried fluid. Wear loose-fitting clothing that allows the piercing to breathe: cotton works best. Do use a new Dixie cup and Q-Tip each time you clean. Ask your piercer if you have any problems or questions. Do not use any type of ointment on the piercing—A&D, bacitracin, Neosporin, or Bactine— because it can smother a piercing. 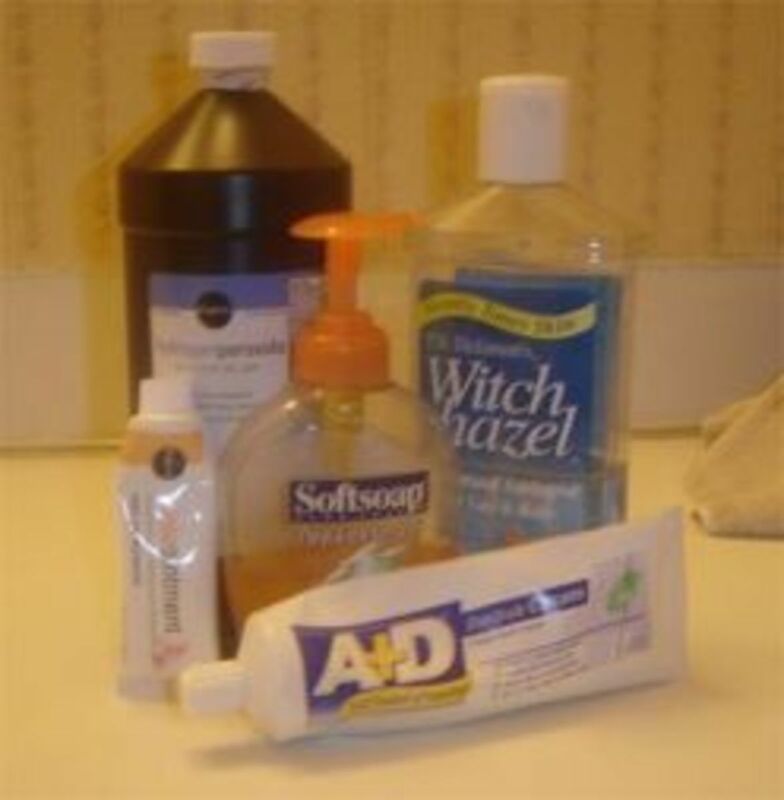 Do not use hand sanitizer, Dial soap, or peroxide, as they are all too harsh for a piercing and can cause irritation. Do not wear tight-fitting clothing that restricts the breathing of the piercing. Do not touch your piercing for any reason other than to clean it. Do not change the jewelry until you are absolutley healed. The best thing to do is to return to the piercer to make sure it's okay to change it, and perhaps to get him or her to change it for you. It's also good to buy the new jewelry from your piercer, so that you know you are getting high-quality jewelry. Do not wear heavy barbells or barbells with danglies (things that hang) for extended periods. Danglies can catch on belts, pants, or shirts, which will irritate the piercing. The weight of heavy jewelry will pull on the piercing and irritate it. If you want to wear something gaudy and "bling blingin'" to "da club" that's fine, as long as you replace it with a normal, lightweight piece of jewelry when you get home. Don't go into a pool, hot tub, ocean, lake, or any other body of water until your piercing is healed. It is unsanitary, and submerging the piercing in unclean water is bound to cause you irritation. Don't use a tanning bed with a healing piercing. I got my navel piercing yesterday(April 13 2019)it didn't hurt much ..just for a second... its still a bit tender and all .Thsnk u for the tips! I got my belly button pierced today (13th April 2019) and it’s really sore I was obviously expecting it ache but not this bad is there anything I can do to help it ? Is it normal for the skin around the actual bar to try to heal around it? Ok so I really want one but I only wear high waisted jeans, can I still get one? Can i go clubbing the same day i get a navel piercing? I got it peirced 4 weeks ago , and one of my balls fell of the pericing , if I take it out till the morning will it close ? Sooo I just got my piercing and I read somewhere that they should of used a Bar kinda but instead they used a ring type because rings can be to heavy and possible cause problems..is it ok? 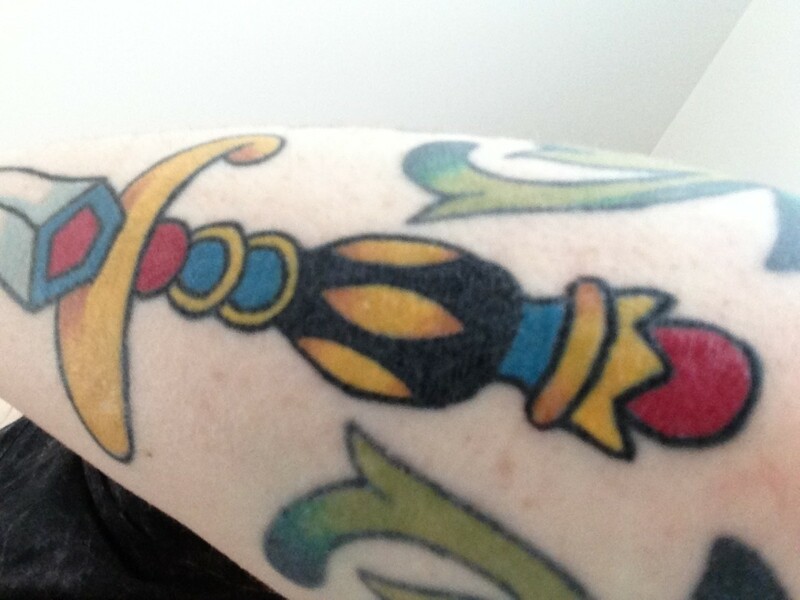 Well it still heal ok?and can a Bar one still fit in it when it is healed enough to change? I've had my belly pierced for three weeks now when can I take a sit down bath? And it peeling around the top ball what does that mean? Also, as for the pool questions, I swam every day in a chlorinated pool, day one it stung a little but after that nothing. The reason it stung was because it wasn't even 5 hours after it was pierced. I also went into lakes and rivers within a wk to two wks after I just cleaned it when I was done swimming. This new "advise" I see plastering the internet I truly believe is hogwash. Ever friend I have that for a naval ring followed my advise and had no issues, but no I am not a professional, but I am experienced. I have 5 piercings not including my ears. I have had my naval ring for over 15 years. I used sea salt, antibacterial soap, Bactine, and Vaseline. I had absolutely NO issues with mine, it healed great, so I don't along with many others understand why you say not to use these products. Can i use iodised salt for the salt water? De , you should probably wait until track season. I wouldn't risk it. Okay im getting mine done but im on the swim team so should i wait untill track season and get it or will i be able t get it now and work my way around it?? I highly recommend to everyone wondering whether to get it done; WAIT UNTIL WINTER! That's what I did. It means your friends or school are less likely to ask you to go swimming and whatnot. This means by the time summer rolls around again, you'll be able to swim to your heart's content. DO NOT swim for at least 4 weeks at the VERY least!!!! Even if you think the water is super sterile and really clean it doesn't matter! I peirced my belly 3 days ago and each day the red gets worse and it hurts really badly.... I've been putting ointment I was given to put on it and Bactine( lady who has her belly pierced said to use it)..
Is it getting infected ? Okay, so I got my belly button pierced last Monday night, and I've been pretty diligent with cleaning it and not touching. The only problem is that I have a pool in my backyard and my parents are extreme with cleaning it because of small kids coming over now and again; so my question is, can I go in the pool or not? Because while I've read that it's a huge no-no, I'm fairly certain the chances of an infection caused from the pool are slightly lower than the chances of an infection from not cleaning the excess shampoo from around the piercing. BUT I don't know anything for certain, and I'd rather ask and find out before I end up with a problem. If I was to go in the pool and clean it afterwards (like asap) would that be okay? Or should I steer clear altogether? A lot of people are asking things like "I just got it done two hours ago and it still hurts, is that normal." Yeah, for the most part it is. You just had a 14g needle shoved through your skin. Be careful not to sleep on it, clean it religiously with non-iodized saline solution and do not touch it for any other reason. Wait as long as your piercer told you to change it. Get high quality jewelry to change into. Piercings are tedious and require a lot of care and if you won't give you're piercing that care, you're not ready to have it. AnonymousGirlie - funny how you say young girls should not get it done and you aren't even 19 yet! And your parents don't want you to get it but you are anyway? Makes no sense. I agree with you that 6th graders should not get it done but you are not that old yourself! On this site it tells you not to use soap but mainly every piercing/tattoo place tells you to clean it with a Triclosan based soap with no fragrances in it, like liquid dial but remember NO FRAGRANCES that will irritate it and make it worst. Clean it with that and some form of saline spray like H2Ocean and you should be fine. I've had mine pierced 3 times now. The amount of stupid questions and ridiculous grammatical errors on this site are mind-boggling. I don't know how young YOUNG girls are getting this done and their parents are completely okay with it. I'm almost turning 19 years old and I had to save up my own money for it and basically tell my mother it's my body it's my choice I'm a legal adult and can do this if I want to. So I did. I got it done a little over a week ago and it's healing fine. Use antibacterial soap and sea salt to clean it. Taking vitamin C helps it to heal a lot faster (I know this because I've used it before for my cartilage piercings). Ask all your weird questions at the piercer if they don't already tell you before/after it's done. It hurts a bit when the needle goes through, the clamp doesn't hurt at all. I hope you people really didn't go swimming 2 days after getting it done, but whatever. heyy my dad wont let me get my belly done and my friend told me that she would do it for me should i let her do it for me ? I've got mine done and I just got told to clean it every day with salt water for a while and leave it in for 12 weeks and not mess with it. It's fine it bled on the day which they said it would, I just cleaned it with salt water, it felt a bit sensitive for a couple of days, it's almost a week since I got it done and it feels fine I didn't get told to do all this stuff, they said don't buy savlon and that just use salt water. I got mine done 4days ago and its red and it hurts a little but i clean it 5 times a day but i also take care of a 2 yr old who always hits it so is it red becuz of him? Hi I'm going on a school trip to Paris for a week next Monday and we are doing lots of activities involving swimming , I'm not sure whether to get it done now or wait til I get back? I'm also going to Spain in August with my friend and we will also be swimming! Ps in Paris we will swimming in aqua boulevard (public pool) although in Spain I will be going swimming in the sea so do you think it's a better idea to get it done in the winter? my suggested aftercare...use only seasalt. the best way to heal a piercing is good hiegene and as naturally as possible. please do not "play with" or touch your new piercing as this will transfer bacteria and possibly cause infection. only touch when cleaning! do not use harsh soaps or ointments BC this will irritate your piercing. also no pools, rivers or hottubs which can harbor bacteriA. i had mine for a month and im scared that it will get infected puss comes out and its nasty. well i use soap, sea salt and bactine. Fist i wash it with antibacterial soap and i clean it then i put the sea salt water for five minutes and then i put bactine is this the right thing to do? I just got my belly button pierced like 2 hours ago & it still hurts a little bit. The piercer said to use Dial soap on it but I've been looking on the web & almost ALL of them say not to use Dial soap so what should I use ? Should I use sea salt because my cousin used sea salt & her healed just fine . I'm 13 & a big baby & it really didn't hurt at all I mean it's just like someone pinching your belly button as hard as they can for like 10 seconds ! I'm just afraid that it'll get infected or something . The piercer said not to change it from the hoop to a banana bar until 6 months , but all my friends said that their piecer said to wait 6 weeks. How long should I wait ? I got my piercing two days ago and so far so good. Looks great. I stocked up on Dixie cups, but they can´t they the pressure. They just get soggy and crumple and I end up with salt water all over. Are there any special type of cups one needs to get? I pierced my belly.. somehow I feel its not in the centre. Little bit on my right... Is it okay? Or should I re pierce it and when? It's the 5thday today. Please help. I got my belly button pierced yesterday and it hurts bending back and forth. i just g0t mine 4 days ag0 and i been using bactine and i got a dangly ring so im scared that it is going to get infected today i noticed that it is like redish around n it hurts when i bend over or try to move it up and down is this normal? I pierced my belly button myself two days ago. During this time I have sprayed a saline solution on it every few hours and it seems to be doing fine. The only thing is I would like to go swimming in our local chlorine pool. Is it okay to go Swimming but straight afterwards shower and then spray the saline solution on? after how long can i swim after getting a belly button piercing? help please! ok, so i got my belly peirced like 9 weeks ago and i changed it recently since it wasn't going too well. It was so red at both sides and puss kept coming out and hurt every time i touched it, so i changed it and its soo much better. However, im worried that it will get infected since i changed it too early. will it? Honestly, it doesn't sound like it's doing well. It shouldn't be red after two week, when pierced properly. How are you cleaning it? The chemicals that you used does not properly clean any piece of jewely. What type of bar did you use- straight or curved? Rings are not ideal for navel piercings. Stick with a curved barbell. I pierced my belly button myself about 2 weeks ago. I'm 16, and mind you this isn't the first thing I've pierced on my own. I've double pierced my ears, and tried to do a thrid, but did not succede. My piercing is red and swollen, and there is some discharge, but not a lot. It's a little tender. But right now I still have just a bar that I disinfected in (1st) Hydrogen Peroxide for 15 minutes (2nd) Rubbing Alcohol for 10 and (3rd) Saline for another 15. Do you think it will be ok if I take it out and put in a proper ring? Or will that be bad for it? I just got my belly button pierced today and was wondering about sports juring the healing part is there anything i should try to avoid? Btw my sports are netball and softball. I want one and I was wondering do they always use the clamps? Can you use sea salt && water to clean it or would it just be better to get some after care spary at the shop I think its called H2O ocean spary? Idk what is the best way to take care of it?I just got this done yesterday. So I'm like mm. Which way is better.? I've gotten by belly button pierced for over 5 years now. Also I've been reading about a 12 year old getting it done, DONT DO IT YET! just wait. For everyone it hurts different and for some none at all so there is no point in asking how much will it hurt and will it, it really varies on the person. Make sure you clean it with WARM salt water! not regular salt! do this 2 times a day. Try not wearing tight clothes for a while and go swimming, I'd suggest not doing it summer time. I Got My Belly Done 5 Days Ago And I Have Had It Done Before I Really Want To Change It Can I? igot my stomach peirced 2 days ago. my friends want me to go swimming tomaro and i was wondering if it wud be okay that i went so soon? Okay, so I just got my navel pierced 12 days ago and it's healing really well. The piercer told me to use bactine unless it made it red so just to be safe I only use it right before I get in the shower then I use dial antibacterial soap (unscented). He also said to take a 50 mg Zinc supplement 3 times a day with meals to help boost your immune system and heal it quicker. I've only pulled it a couple of times which only hurt for like 2 seconds. I really think the Zinc supplement works well. So just something to try :) good luck. I just got my belly button pierced like 4 hours ago, it didn't hurt at all. They say the clamps is the worst part but its not. It feels like your taking your finger nails and pinching as hard as you can for 15 seconds. Its better to clean with saltwater or uncented anti bacterial soap. You will have bleeding for a little bit especially if you bend a lot but its okay. It'll only sting a little bit when cleaning to. I hope this helps! many of my friends got their belly buttons peirced, and they all use different things, i use sea slt and bactine, is bactin ok to use? or should i use dial soap, but my mom doesn't know i have my peircing, so i want it to heal as soon as possible. I was wondering if it would be safe to go swimming in a lake? and if i could what would happen and what should i do about it? I'm Going To Get My Belly Button Peirced Tomorrow & I Need to know how often I should clean it! hi,I might get my belly pierced for my 12th birthday.Im not scared about getting it done but is this a bad idea, for my age? I just want it for me,and not anyone eles. so i got my belly button pierced like 4 hours ago. when should i clean it for the 1st time? before i go to bed? also, i have a sea salt spray for it... do i just spray it on and leave it so it makes the dry blood soggy? how do i CLEAN it? just use a q-tip and scrape the dry blood away after i use the sea spra? Im getting my belly done soon and I was just wondering wat the best way of sleeping ( on ur back, side etc.) was best for the piercing? I have had my piercing for 3 wks n wen I clean it it sumtimes hurt a lil but it's not unbearable I can move it n it itches a lot is dis part of da healing process??? i had my belly pierced yesterday, i went through all the pros and cons coz i've wanted one for ages, however i don't know whether i now regret having it, did anyone else feel this way? i can't bend over or lean forwards e.g i can't put my shoes on because i can't crouch because of this piercing hurting me, does that go away? and if i do decide that i really don't want it in anymore, how long will it take for the hole to close up and will it scar? I got my belly button pierced with my friend yesterday, mine really hurt and I nearly fainted but she said hers only hurt for a few seconds. After we got it done mine was still hurting unlike hers. Eventually it stopped hurting..until I got home and cleaned it, it was so painful! Mine is still hurting now(day after getting it pierced) is this normal? I got my belly button pierced on Friday. It did hurt for a mintue but then the pain went away. MY piercer told me to wash it twice a day with Spectra gel (not spectro gel), he also said to move it around only while washing it so the soap can cleanse the piercing, and to do saltwater bath 2 times a week. just a tablespoon of sea salt in a cup of previously boiled water hold it over the piercing for about 5-15 minutes, it is said to speed up the healing process and it also works for when it gets infected. Also be aware when your body is rejecting the navel piercing. Unfortunately there are just some people who's bodies just can't tolerate a foreign object. This is my 3rd attempt, I got mine re-pierced 4 weeks ago, I clean & care for it appropriately and & its not even trying to heal, so I give. hey i am 12 and my parents said i could get it done at 14 but i cannot wait i am dreaming about it i am thinking about it all day at school it is taunting me i just cannot wait. so i made a thing of pros and cons and lists of things i will do if they let em get one now but my mom is like not talking to me did she read it does she agree with it i just cannot get it off my mind i need help wat should i do? After you get it pierced don't touch it at all. After about two days clean it with anti bacterial soap and a salt water solution. 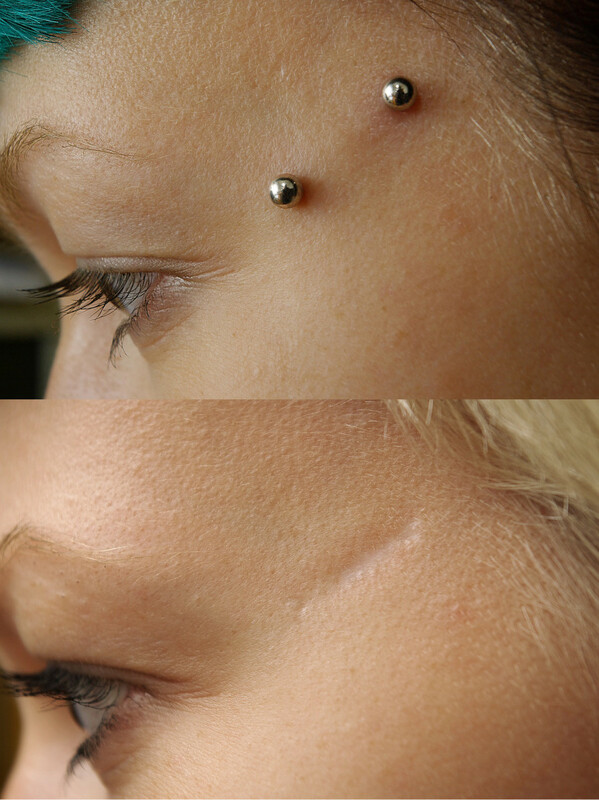 DO NOT move it around or play with it, doing this irritates the piercing. Also don't listen to what your friends tell you, listen to the piercer dud or chick that pierced it but only if they're a professional and have certified proof. If you didn't get it done professionally go to a piercing salon and ask them! I have had my navel pierced for about 3-4 months now. It got infected and I treated it with salt water, that's what the piercer told me to use. Now the infection is gone but I keep having this liquid come out of it every day, it's yellowish, greenish. If I dont clean it it becomes crusty, so Im always using a toothpick and cleaning the liquid/crust. Is that normal? If not how do I make it stop? okay so i want to get my belly button pierced... i have a few questions... My biggest question is will it hurt? different people say it does but most people have said no. my second is... How long does it take to get it done? I got my belly button pierced about a month ago and it seems to be healing well. However, I'm a little worried about the lower ball. It has a red, snot like piece of flesh surrounding it. Keep in mind its a very small amount of flesh but it is attached... is that normal? Thanks. so i swim competitively...and i have my belly botton pierced. is this a bad thing? considering all i see is that its not good to swim with one because its not clean and what not. Hello does sleeping on your belly effect the heeling process ?? i got the top of my bellybutton pierced when i was 16 and it pussed for like a day and then it went away. i switched the ring about a year after and my body rejected it got it pierced again about 4 times and it did the same i am now 18 and i got the bottem done and i cleaned it with antibacterial soap for about a week and left it alone and i havent had any problems but the piercer person messed up and had to pierce mine twice.. im not gonna change the ring untill its compleatly healed ive changed the balls on the ring but not the ring itself sometimes i take it out and get rid of the crusties on the top part of the ring and then put it back in and clean it but other then that i havent had any problems. ok so im going to get my belly button pierced tomorrow and im so scared that its gonna hurt. i know that it will but idk im still scared. I also have no idea on what to clean it with? any advice? I qot my belly button peirced 3 days aqo. && my peircinq dude said to clean it with sea salt water stuff. Which I qot it at walmart near the jewerly section by the belly rinqs. They have a certain spray for it. && I clean it about 5 times a day. I haven't had any problems at all. && I qot it peirced over a scar && it didn't hurt. So if yuh just use the sea salt spray stuff it works well always wash your hands before you clean it or touch it. Well I hope that helps some of you. Do what your piercest tells you to, they have been through this many times. My piercest told me saline solution so you could use that or just go with what your piercest suggested. I jus got my navel pierced today, I am a bit scared cause I don't want it to get infected. I really nrd some help about after care. My piercer told me to us triple antibiotic ointment and salt solution, what should I do. Coud someone please help me?